Have you ever written a series of posts for your blog – a set of posts that are deliberately linked together? If you haven’t, I hope I can convince you to give it a try. Some bloggers feel writing a series of posts is more daunting than writing individual posts. But it’s often easier to come up with ideas for a ten-post series than for ten standalone posts. Here at ProBlogger we’ve run a number of series over the years, including 31 Days to Build a Better Blog, which I’ll be coming back to later in this post. So why should you write a series of posts instead of just individual posts? Dig deep into a particular topic, showcasing your expertise. Encourage readers to keep coming back for more. Create plenty of internal links between your posts (good for both SEO and encouraging readers to dig deeper into your site). Build a comprehensive piece of content readers can bookmark, share, and keep coming back to (especially if you have an introduction post or an index of posts). Even if your blog is new, you can still run a series. In fact, it can be a great way to get some solid cornerstone content up there early on. Two Different Approaches to Running Your Series: Which is Right for You? This type of series runs for a set period of time, and every post published on the blog during that time is (usually) part of the series. For instance, a three-part series of linked posts may appear on a Monday, Wednesday and Friday. And on the following week, the blogger goes back to standalone posts. We’ve done this on ProBlogger with ‘Theme Weeks’ such as Creating Products Week — a series of five blog posts on how to create products for your audience. This type of series can run indefinitely, with posts appearing on a specific day of the week or month, or even at a particular point in the year. And standalone posts appear as normal between installments of the series. An ongoing monthly series on the first Tuesday of each month. For example, if you blog about healthy eating, you might publish a new recipe at the start of each month. An annual review of your progress in your niche each December or January. It can be tough enough coming up with an idea for one blog post. So how do you come up with a great idea for a series? A topic that you’ve already covered, but not in much depth. A series could give you the chance to really dig into the topic and examine different aspects of it. We did this on ProBlogger last year with a series on guest posting. Beginner-friendly topics that would make a good introduction to your blog or niche. The posts themselves could all be on different topics, but you can link them together by having them aimed very much at beginners. Something you could blog about pretty much indefinitely. It could be the week’s news in your niche, your monthly results from affiliate marketing, or common mistakes you see beginners making in your field. A particular style of posts. You could have a weekly “Q&A” like Trent Hamm’s “Reader Mailbag” on his blog The Simple Dollar, or a “monthly motivation” post where you collect together inspiring quotes. The series as a whole. It will need a beginning and, if it isn’t an ongoing series, an end. These might be short sections of a post, or posts in their own right (for a long series). For instance, you might write a post to introduce the series and explain what’s coming. You can then update this post with links to the different parts of the series. have a particular format for each post, such as a quick recap at the start and a task or assignment at the end. It’s crucial to link the parts of your series together so readers can easily navigate between them. Remember, not everyone will read your series as you publish it. Some readers will be busy, and will want to catch up with the whole series later. But many more (hopefully) will come to your series in future weeks and months through search engines or social media. 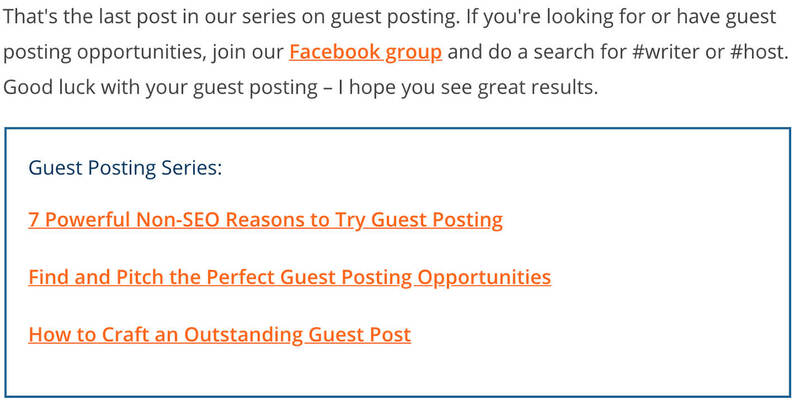 Create a tag or category for the series, which is what we did with our guest posting series. Readers can then get all the parts of the series by clicking that tag/category name. If you’re running an ongoing series of weekly/monthly posts, this is probably the best way to organise it. Put a link at the top of each post leading to the previous part(s), so readers can easily go back to any posts they missed. Create a page or post with links to every post in the series. You can do this before you run the series and update it as you publish each part, or do it retrospectively. Add links to the body of the post whenever you mention a topic you’ve already written about in the series. (You can also go back to earlier posts and link them to later posts in the series.) This saves you having to repeat yourself a lot, and makes it easy for readers to find the information they need at any given point. However you choose to link your posts together, make sure you’re consistent. And remember to check back after finishing the series to see if there are opportunities to work in some extra links. Once you’ve completed a series, or have been writing an ongoing series for a while, it’s worth considering whether you can repurpose your series into something else. Bringing your posts together as a free ebook, perhaps with some bonus content. For instance, if you’ve published ten monthly recipes on your blog, you could put those recipes into an ebook and add five extra recipes you haven’t published. You might also use a short series as the inspiration for a longer one, or an ongoing series as an opportunity to get readers involved on your blog. I’d love to hear how you’re using a post series, or what ideas you have for using them in the future. Leave a comment below to share your thoughts with us. 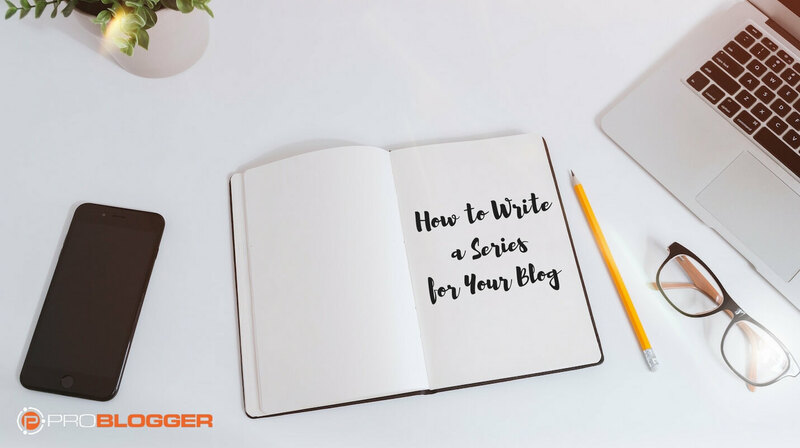 The post How to Write a Series for Your Blog (and Why You’ll Want To) appeared first on ProBlogger.